Amyloidosis is a disorder of protein folding in which normally soluble proteins undergo a conformational change and are deposited in the extracellular space in an abnormal fibrillar form. Accumulation of these fibrils causes progressive disruption of the structure and function of tissues and organs, and the systemic (generalized) forms of amyloidosis are frequently fatal. The conditions that underlie amyloid deposition may be either acquired or hereditary, and at least 20 different proteins can form amyloid fibrils in vivo. See the image below. Proposed mechanism for amyloid fibril formation. The drawing depicts a generic amyloid fibril precursor protein (I) in equilibrium with a partially unfolded, molten, globulelike form of the protein (II) and its completely denatured state (III). Autoaggregation through the beta domains initiates fibril formation (IV), providing a template for ongoing deposition of precursor proteins and for the development of the stable, mainly beta-sheet, core structure of the fibril. The amyloidogenic precursor proteins in patients with familial renal amyloidosis are thought to be less stable than their wild-type counterparts, causing them to populate intermediate, molten, globulelike states more readily. Renal dysfunction is one of the most common presenting features of patients with systemic amyloidosis, and amyloid accumulation is the major pathological finding in approximately 2.5% of all native renal biopsies. Most such patients have either reactive systemic (AA) amyloidosis or monoclonal immunoglobulin light-chain (AL) amyloidosis, but in the few remaining cases, the disease is hereditary. The syndrome of familial systemic amyloidosis with predominant nephropathy is inherited in an autosomal dominant manner and was first described in a German family by Ostertag in 1932. Research has shown that almost all patients with familial renal amyloidoses (FRA) are heterozygous for mutations in the genes for lysozyme, apolipoprotein AI, apolipoprotein AII, or fibrinogen A alpha-chain and that the amyloid fibrils in this condition are derived from the respective variant proteins. Both penetrance and the clinical phenotype can vary substantially among different families with the same mutation, and even within individual kindreds. The pathogenesis of amyloid centers around off-pathway folding of the various amyloid fibril precursor proteins. These proteins can exist as two radically different stable structures: the normal soluble form and a highly abnormal fibrillar conformation. All amyloid fibrils share a common core structure in which the subunit proteins are arranged in a stack of twisted, antiparallel, beta-pleated sheets lying with their long axes perpendicular to the fibril long axis. Proteins that can form amyloid transiently populate partly unfolded intermediate molecular states that expose the beta-sheet domain, enabling them to interact with similar molecules in a highly ordered fashion. 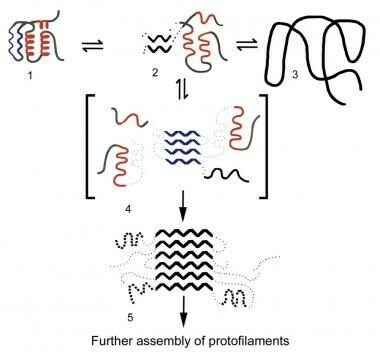 Propagation of the resulting low molecular weight aggregates into mature amyloid fibrils is probably a self-perpetuating process that depends only on a sustained supply of the fibril precursor protein. In some cases, the precursors undergo partial proteolytic cleavage; however, whether this occurs before, during, or after the formation of amyloid fibrils remains unknown. Studies on hereditary amyloidosis have provided unique and valuable insights into the general pathogenesis of amyloid. Most of the variant proteins associated with hereditary amyloidosis differ from their wild-type counterparts by just a single amino acid substitution, although deletions and insertions also occur (see the Table). Investigation of the variant amyloidogenic forms of lysozyme has been exceptionally informative because wild-type lysozyme is not associated with amyloidosis and has been thoroughly characterized. The amyloidogenic mutations give rise to amino acid substitutions that subtly destabilize the native fold so that, under physiological conditions, these variants readily visit partly unfolded states, promoting their spontaneous aggregation into amyloid fibrils. The whole process of lysozyme amyloid fibril formation can be reversed. A soluble functional variant lysozyme has been recovered in vitro from preparations of isolated ex vivo amyloid fibrils that had been denatured and permitted to refold in the normal conformation. Wild-type apolipoprotein AI is inherently moderately amyloidogenic, and small amyloid deposits derived from it occur in aortic atherosclerotic plaques in 20-30% of middle-aged and elderly individuals. Amyloid deposits in all different forms of the disease, both in humans and in nonhuman animals, contain the nonfibrillar glycoprotein amyloid P component (AP). AP is identical to and derived from the normal circulating plasma protein, serum amyloid P component (SAP), a member of the pentraxin protein family that includes C-reactive protein. Amyloid deposits accumulate in the extracellular space, progressively disrupting the normal tissue architecture and consequently impairing organ function. Amyloid deposits can also produce space-occupying effects at both microscopic and macroscopic levels. Although amyloid is inert in the sense that it does not stimulate either a local or systemic inflammatory response, some evidence suggests that the deposits exert cytotoxic effects and possibly promote apoptosis. Strong clinical impressions exist that suggest the rate of accumulation of amyloid has a major bearing on organ function, which can be preserved for very long periods in the presence of an extensive but stable amyloid load. This may reflect adaptation to gradual amyloid accumulation or may relate to toxic properties of newly formed amyloid material. Prospective studies with serial SAP scintigraphy, a specific and semiquantitative nuclear medicine technique for imaging amyloid deposits, have confirmed that amyloid deposits are turned over constantly, albeit at a relatively low and variable rate. Therefore, the course of a particular patient's amyloid disease depends on the relative rates of amyloid deposition versus turnover. Amyloid deposits often regress when the supply of the respective fibril precursor protein is reduced, and, under favorable circumstances, this is accompanied by stabilization or recovery of organ function. Many questions about amyloid deposition remain unanswered. Why only a small number of unrelated proteins form amyloid in vivo remains unclear, and, as yet, little is known about the genetic or environmental factors that determine individual susceptibility to amyloid or factors that govern its anatomical distribution and clinical effects. Hereditary amyloid deposition starts in the first or second decade in some patients, but possibly not until much later in life in other patients. In addition, the mechanism by which amyloid deposits are cleared and why the rate of this varies so substantially among patients are not understood. The natural history of familial renal amyloidosis is a relentless gradual progression, leading to renal and sometimes other organ failure and, eventually, death. Amyloid deposits can ultimately affect many organ systems, but they may be widespread and very extensive without causing symptoms. The rate of progression and course of disease are extremely variable. Some patients with clinically overt involvement of multiple organs survive for many years or decades. Overall, the prognosis of patients with FRA is much better than that of those with acquired AA and AL amyloidosis. Most patients are of northern European Caucasian ancestry, but fibrinogen A alpha-chain amyloidosis has been reported in Peruvian-Mexican, Korean, and African American families, and the authors are presently investigating a northern Indian family with uncharacterized FRA. Gene carriage and the incidence of clinical disease are equal between men and women. FRA may manifest any time from the first decade to old age but most typically in mid adult life. The age at presentation, like other clinical features, varies among mutations and even within individual kindreds. Bustamante JG, Brito D. Amyloidosis. 2018 Jan. [Medline]. [Full Text]. Ostertag B. Demonstration einer eigenartigen familiaren paraamyloidose. Zentralbl Aug Pathol. 1932. 56:253-4. Hawkins PN, Myers MJ, Epenetos AA, et al. Specific localization and imaging of amyloid deposits in vivo using 123I-labeled serum amyloid P component. J Exp Med. 1988 Mar 1. 167(3):903-13. [Medline]. Said SM, Sethi S, Valeri AM, Chang A, Nast CC, Krahl L, et al. Characterization and outcomes of renal leukocyte chemotactic factor 2-associated amyloidosis. Kidney Int. 2014 Aug. 86(2):370-7. [Medline]. Castano E, Palmer MB, Vigneault C, Luciano R, Wong S, Moeckel G. Comparison of amyloid deposition in human kidney biopsies as predictor of poor patient outcome. BMC Nephrol. 2015 Apr 29. 16:64. [Medline]. Larsen CP, Kossmann RJ, Beggs ML, Solomon A, Walker PD. Clinical, morphologic, and genetic features of renal leukocyte chemotactic factor 2 amyloidosis. Kidney Int. 2014 Aug. 86(2):378-82. [Medline]. Picken MM. Alect2 amyloidosis: primum non nocere (first, do no harm). Kidney Int. 2014 Aug. 86(2):229-32. [Medline]. von Hutten H, Mihatsch M, Lobeck H, et al. Prevalence and origin of amyloid in kidney biopsies. Am J Surg Pathol. 2009 Aug. 33(8):1198-205. [Medline]. Talamo G, Mir Muhammad A, Pandey MK, Zhu J, Creer MH, Malysz J. Estimation of Daily Proteinuria in Patients with Amyloidosis by Using the Protein-To-Creatinine ratio in Random Urine Samples. Rare Tumors. 2015 Feb 11. 7 (1):5686. [Medline]. Purysko AS, Westphalen AC, Remer EM, Coppa CP, Leão Filho HM, Herts BR. Imaging Manifestations of Hematologic Diseases with Renal and Perinephric Involvement. Radiographics. 2016 Jul-Aug. 36 (4):1038-54. [Medline]. [Full Text]. Barreiros AP, Otto G, Ignee A, et al. Sonographic signs of amyloidosis. Z Gastroenterol. 2009 Aug. 47(8):731-9. [Medline]. Hawkins PN. Studies with radiolabelled serum amyloid P component provide evidence for turnover and regression of amyloid deposits in vivo. Clin Sci (Colch). 1994 Sep. 87(3):289-95. [Medline]. Rydh A, Suhr O, Hietala SO, et al. Serum amyloid P component scintigraphy in familial amyloid polyneuropathy: regression of visceral amyloid following liver transplantation. Eur J Nucl Med. 1998 Jul. 25(7):709-13. [Medline]. Puchtler H, Sweat F, Levine M. On the binding of Congo red by amyloid. J Histochem Cytochem. 1962. 10:355-64. Toros AB, Erdenen F, Sari ND, Gokcay S. Renal and suprarenal insufficiency secondary to familial Mediterranean fever associated with amyloidosis: a case report. J Med Case Reports. 2011 Aug 18. 5(1):390. [Medline]. [Full Text]. Sherif AM, Refaie AF, Sobh MA. Long-term outcome of live donor kidney transplantation for renal amyloidosis. Am J Kidney Dis. 2003 Aug. 42(2):370-5. [Medline]. Holmgren G, Ericzon BG, Groth CG, et al. Clinical improvement and amyloid regression after liver transplantation in hereditary transthyretin amyloidosis. Lancet. 1993 May 1. 341(8853):1113-6. [Medline]. Stangou AJ, Banner NR, Hendry BM, Rela M, Portmann B, Wendon J, et al. Hereditary fibrinogen A alpha-chain amyloidosis: phenotypic characterization of a systemic disease and the role of liver transplantation. Blood. 2010 Apr 15. 115 (15):2998-3007. [Medline]. Zeldenrust S, Gertz M, Uemichi T. Orthotopic liver transplantation for hereditary fibrinogen amyloidosis. Transplantation. 2003 Feb 27. 75(4):560-1. [Medline]. Yilmaz G, Masatlioglu S, Yetkin DO, Demirtunç R, Boysan SN, Kaplan S, et al. Is there a real adrenal axis dysfunction in patients with amyloidosis associated with familial Mediterranean fever?. Rheumatol Int. 2011 Nov 6. [Medline]. Sethi S, Vrana JA, Theis JD, Leung N, Sethi A, Nasr SH, et al. Laser microdissection and mass spectrometry-based proteomics aids the diagnosis and typing of renal amyloidosis. Kidney Int. 2012 Apr 11. [Medline]. Ozturk MA, Kanbay M, Kasapoglu B, Onat AM, Guz G, Furst DE, et al. Therapeutic approach to familial Mediterranean fever: a review update. Clin Exp Rheumatol. 2011 Jul-Aug. 29(4 Suppl 67):S77-86. [Medline]. Koike H, Ando Y, Ueda M, et al. Distinct characteristics of amyloid deposits in early- and late-onset transthyretin Val30Met familial amyloid polyneuropathy. J Neurol Sci. 2009 Aug 24. [Medline]. Koike H, Morozumi S, Kawagashira Y, et al. The significance of carpal tunnel syndrome in transthyretin Val30Met familial amyloid polyneuropathy. Amyloid. 2009 Jul 15. 1-7. [Medline]. Amarzguioui M, Mucchiano G, Haggqvist B, et al. Extensive intimal apolipoprotein A1-derived amyloid deposits in a patient with an apolipoprotein A1 mutation. Biochem Biophys Res Commun. 1998 Jan 26. 242(3):534-9. [Medline]. Benson MD. Ostertag revisited: the inherited systemic amyloidoses without neuropathy. Amyloid. 2005 Jun. 12(2):75-87. Benson MD, Liepnieks J, Uemichi T, et al. Hereditary renal amyloidosis associated with a mutant fibrinogen alpha- chain. Nat Genet. 1993 Mar. 3(3):252-5. [Medline]. Booth DR, Bellotti V, Sunde M. Molecular mechanisms of amyloid fibril formation: the lysozyme model. Clin Sci. 1996. 90 (Suppl 34):1P. Booth DR, Sunde M, Bellotti V, et al. Instability, unfolding and aggregation of human lysozyme variants underlying amyloid fibrillogenesis. Nature. 1997 Feb 27. 385(6619):787-93. [Medline]. Booth DR, Tan SY, Booth SE, et al. A new apolipoprotein Al variant, Trp50Arg, causes hereditary amyloidosis. QJM. 1995 Oct. 88(10):695-702. [Medline]. Booth DR, Tan SY, Booth SE, et al. Hereditary hepatic and systemic amyloidosis caused by a new deletion/insertion mutation in the apolipoprotein AI gene. J Clin Invest. 1996 Jun 15. 97(12):2714-21. [Medline]. de Sousa MM, Vital C, Ostler D, et al. Apolipoprotein AI and transthyretin as components of amyloid fibrils in a kindred with apoAI Leu178His amyloidosis. Am J Pathol. 2000 Jun. 156(6):1911-7. [Medline]. Gillmore JD, Booth DR, Madhoo S, et al. Hereditary renal amyloidosis associated with variant lysozyme in a large English family. Nephrol Dial Transplant. 1999 Nov. 14(11):2639-44. [Medline]. Gillmore JD, Booth DR, Rela M, et al. Curative hepatorenal transplantation in systemic amyloidosis caused by the Glu526Val fibrinogen alpha-chain variant in an English family. QJM. 2000 May. 93(5):269-75. [Medline]. Hamidi Asl K, Liepnieks JJ, Nakamura M, et al. A novel apolipoprotein A-1 variant, Arg173Pro, associated with cardiac and cutaneous amyloidosis. Biochem Biophys Res Commun. 1999 Apr 13. 257(2):584-8. [Medline]. Hamidi Asl L, Fournier V, Billerey C, et al. Fibrinogen A alpha chain mutation (Arg554 Leu) associated with hereditary renal amyloidosis in a French family. Amyloid. 1998 Dec. 5(4):279-84. [Medline]. Hamidi Asl L, Liepnieks JJ, Hamidi Asl K, et al. Hereditary amyloid cardiomyopathy caused by a variant apolipoprotein A1. Am J Pathol. 1999 Jan. 154(1):221-7. [Medline]. Hamidi Asl L, Liepnieks JJ, Uemichi T, et al. Renal amyloidosis with a frame shift mutation in fibrinogen aalpha- chain gene producing a novel amyloid protein. Blood. 1997 Dec 15. 90(12):4799-805. [Medline]. Jones LA, Harding JA, Cohen AS. New USA family has apolipoprotein AI (Arg26) variant. Amyloid and Amyloidosis. 1991. 385-8. Nichols WC, Dwulet FE, Liepnieks J, Benson MD. Variant apolipoprotein AI as a major constituent of a human hereditary amyloid. Biochem Biophys Res Commun. 1988 Oct 31. 156(2):762-8. [Medline]. Obici L, Bellotti V, Mangione P, et al. The new apolipoprotein A-I variant leu(174) --> Ser causes hereditary cardiac amyloidosis, and the amyloid fibrils are constituted by the 93- residue N-terminal polypeptide. Am J Pathol. 1999 Sep. 155(3):695-702. [Medline]. Pepys MB, Hawkins PN, Booth DR, et al. Human lysozyme gene mutations cause hereditary systemic amyloidosis. Nature. 1993 Apr 8. 362(6420):553-7. [Medline]. Persey MR, Booth DR, Booth SE. A new deletion mutation of the apolipoprotein AI gene causing hereditary amyloidosis. Clin Sci. 1996. 90 (Suppl 34):33. Persey MR, Booth DR, Booth SE, et al. Hereditary nephropathic systemic amyloidosis caused by a novel variant apolipoprotein A-I. Kidney Int. 1998 Feb. 53(2):276-81. [Medline]. Soutar AK, Hawkins PN, Vigushin DM, et al. Apolipoprotein AI mutation Arg-60 causes autosomal dominant amyloidosis. Proc Natl Acad Sci U S A. 1992 Aug 15. 89(16):7389-93. [Medline]. Uemichi T, Liepnieks JJ, Alexander F, Benson MD. The molecular basis of renal amyloidosis in Irish-American and Polish- Canadian kindreds. QJM. 1996 Oct. 89(10):745-50. [Medline]. Uemichi T, Liepnieks JJ, Benson MD. Hereditary renal amyloidosis with a novel variant fibrinogen. J Clin Invest. 1994 Feb. 93(2):731-6. [Medline]. Uemichi T, Liepnieks JJ, Gertz MA, Benson MD. Fibrinogen A alpha chain Leu 554: an African-American kindred with late onset renal amyloidosis. Amyloid. 1998 Sep. 5(3):188-92. [Medline]. Uemichi T, Liepnieks JJ, Yamada T, et al. A frame shift mutation in the fibrinogen A alpha chain gene in a kindred with renal amyloidosis. Blood. 1996 May 15. 87(10):4197-203. [Medline]. An extended kindred with hereditary amyloidosis associated with fibrinogen A alpha-chain Glu526Val; disease penetrance is high in this particular family. Partial DNA sequence of the gene associated with fibrinogen A alpha-chain Glu526Val in a patient with familial renal amyloidosis, and a sequence from a healthy control. The mutation, which alters codon 526 from glutamic acid to valine, is marked with an arrow. Progression of amyloid deposits in a patient with amyloidosis associated with fibrinogen A alpha-chain Glu526Val. These serial posterior, whole-body, scintigraphic images were obtained following intravenous injection of iodine-123 (123I)–labeled human serum amyloid P component into a 48-year-old man with hereditary amyloidosis associated with fibrinogen A alpha-chain Glu526Val in whom asymptomatic proteinuria had been identified. Both parents were alive and well and older than age 80 years. The scan at diagnosis (left) showed modest abnormal uptake into renal amyloid deposits, which increased at follow-up 3 years later (right). The remainder of the image represents a normal distribution of tracer throughout the blood pool. Regression of amyloidosis associated with fibrinogen A alpha-chain Glu526Val following hepatorenal transplantation. The pictures are serial anterior, whole-body, scintigraphic images obtained following intravenous injection of iodine-123 (123I)–labeled human serum amyloid P component into a patient with amyloidosis associated with fibrinogen A alpha-chain Glu526Val. Prior to hepatorenal transplantation (left), heavy amyloid deposition was present in an enlarged liver and spleen. No amyloid deposits were identified in a follow-up study obtained 42 months after hepatorenal transplantation (right); only a normal distribution of tracer is present throughout the blood pool. Regression of amyloidosis associated with apolipoprotein AI Gly26Arg following hepatorenal transplantation. These serial anterior, whole-body, scintigraphic images were obtained following intravenous injection of iodine-123 (123I)–labeled human serum amyloid P component into a patient with hereditary amyloidosis associated with apolipoprotein AI Gly26Arg. Prior to hepatorenal transplantation (left), heavy amyloid deposition was present in the liver, obscuring the kidneys. Two years after combined hepatorenal transplantation (right), a follow-up scan was normal, showing tracer distributed evenly throughout the background blood pool, including the transplanted organs. Splenic amyloid deposits that were evident initially in posterior scans had regressed at follow-up.